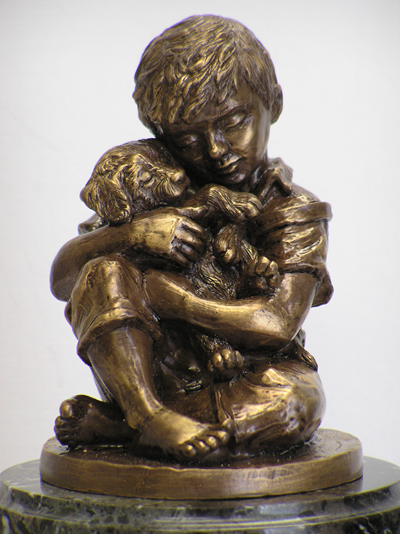 A heartfelt bronze resin sculpture, the "Best Friend" pet urn evokes memories of love and companionship. The sculpture has the look and feel of bronze, but is cold cast in an affordable designer resin and sits atop a hardwood urn available in your choice of cherry, oak, or walnut finish (cherry and walnut showing). The base of the urn is attached with four screws for easy loading. Large: 13.5"H x 6.5"D x 6.5"W - 110 cubic inches (large enough for most pets weighing up to 80 lbs). Dimensions of just the large wood urn are 8.75" x 6.25" x 6.25"